Try clicking on IFL > for more details. Check the cable and F connectors using a DC ohms meter. Bring both ends close together and check for open circuit, high resistance or short circuit cable / connectors. If short circuit check that no fragments of braid sheath or braid wire are short circuiting between centre conductor and outer. The centre pin of an F connector should protrude about 2 mm beyond the front rim of the plug. The end of the pin should preferably be pointed sharp, so it pushes smoothly into the hole. �It is important that the pin does not get stuck and then cause the cable to be pushed back within the plug body. A smear of electronic grade contact grease on the pin helps. �The entire outdoor F connector must the sealed from moisture. An excessively short centre pin will not make contact. �An excessively long pin may premanently damage internal components of the modem or LNB/BUC. �Use firm finger tightness only to screw in. Forceful use of a spanner will damage internal components. The majority of VSAT faults are due to poor workmanship with the F connectors or lack of precision with the dish pointing. 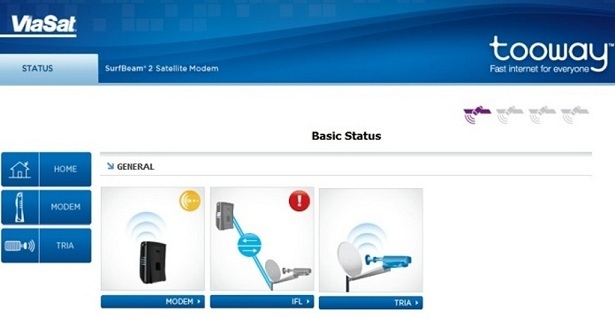 The modem status screen is just a guide ... it's not a precision diagnostic instrument. I've seen this screen before and the problem turned out to be the Tria. As you have already replaced the cable (and followed Eric's guidelines on terminations) then the Tria is the most likely suspect ... time to speak to your supplier. looks to me the F-connector is connected to the wrong female. It should be connected at the side where the earth-cable screw is.. from feedhorn direction: Right..